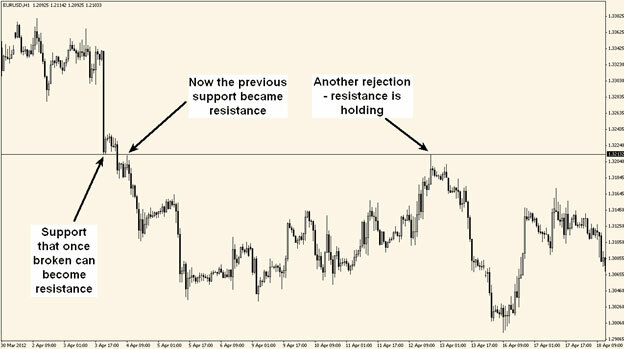 Today we are going to talk about one of the most important things in Forex and trading in general: support and resistance (S/R) - must be mastered and respected always. 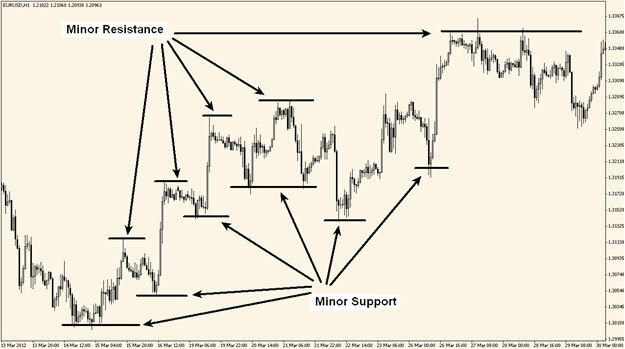 When you finish reading this lesson, you will not be an expert in trading or identifying support and resistance levels, but you will learn the much needed basics. For some of you, years will pass until you can properly identify S/R levels; for others, the happy moment will come in a few months. You will eventually get there, but it takes practice and patience. Support and resistance trading is what the “Big Boys” use to make their billions, it’s their favorite tool and we urge you to learn to use it. You won’t be sorry. Ok, here we go. 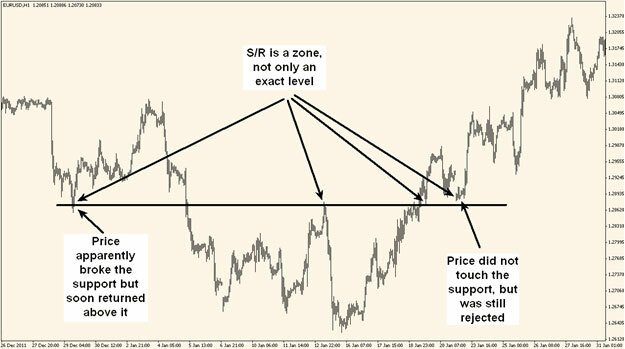 The first thing you must do when trying to identify S/R levels is to find places on charts where price was rejected. The market never moves in a straight line and as it advances, it creates highs and lows. The highs become resistance and the lows are now support, just like the picture below. There is one more very important thing you should know about S/R levels: they are not exact numbers, but more a zone that rejects price. In the picture below, we have a zoomed out chart for you to see how S/R levels are sometimes a zone. When you will watch the charts, you will encounter a lot of situations where price apparently broke the level, but was soon rejected. That is still a valid S/R level. Just like in the case of trend lines, you can trade the bounce or the break of a S/R level, but knowing what are the conditions for a valid break or bounce will come with time and experience. We can give you a tip though: the break of a S/R level by long candles, with small or no wicks and strong momentum, is more likely to be a real break. What we know with a high level of probability is that price will react when it meets a S/R level. Sometimes, even the lack of reaction is by itself a reaction. Let us explain this with an example: price formed a nice level of support, touching it five times and being rejected every time, but the sixth time, it went right through, with no reaction to the previously strong level of support. This is a clear indication of tremendous selling pressure and probably you won’t even see a test from below of the level, but price will continue its move down. This is when no reaction to a S/R level actually means price reacted. Further, we will go into more detail regarding the psychology behind the support level in the case presented above: sellers are trying to push the price through the support level, but every time they reach the support, buyers push the price higher. As we know, all levels fail and eventually our support level will fail too. When that happens, more sellers join, because they can see clearly now that buyers lost the battle. Those additional sellers will bring the price even lower. And there is something that plays a very important role: usually Stop Loss orders are placed by buyers a few pips behind the support level. Remember one of our first lessons when we said “…when we close a transaction we actually take the opposite trade to our initial one”. Well, a buyer with a Stop Loss hit turns into...you guessed it – a seller. Now the sellers greatly overwhelm the buyers and the remaining buyers have no power. All this mechanism generates the massive amount of selling pressure needed by price to break that level of support without even returning to test it from below. After all, psychology has a lot to do with trading because markets are driven by human emotions and we can’t always control those.